First Lutheran Church began its ministry in 1888 in downtown San Diego and that is where we have remained. 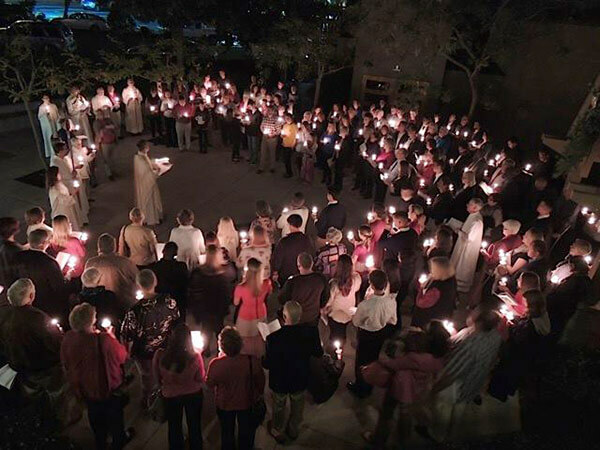 We are the oldest Lutheran congregation in Southern CA and have become a beacon of Christ’s light to all who come through our doors or dine on our patio. We are a “huggy” and compassionate bunch that through our 129+ year history have accepted and welcomed in fellowship and an open communion table active military, veterans, homeless, gay and transgendered individuals and families. First Lutheran has been a Reconciling in Christ (RIC) congregation since 1989, welcoming all people regardless of race, ethnic background, or sexual orientation. To become a Lutheran, one need only be baptized and receive instruction in the Christian faith. First Lutheran offers membership classes several times a year and if you are not baptized – we have a passion for Baptism. It is at our Baptismal pool with flowing living water that we begin our life in the church and it is from here, at the end of life, where we are entrusted to the baptismal promises of eternal life. If you are interested, please contact the church office. The Lutheran Church is the oldest Protestant Christian tradition, dating back to the Protestant Reformation in 1517 and the challenge from Augustinian Monk Martin Luther of the doctrines and practices of the Roman Catholic Church. Luther challenged the Catholic Church to be more consistent with Biblical teachings. This debate escalated to the extent that Luther himself and his followers split from the Catholic Church and became known as Lutherans. Lutheranism spread from Germany to most countries across the globe and has become one of the largest Protestant denominations. The Luther Rose is easily the most recognized symbol for Lutheranism. Martin Luther personally oversaw the creation of this coat-of-arms as an expression of his theology and faith.